It is not necessary to consume saturated fat in a healthy diet. Saturated fat causes your LDL or bad cholesterol levels to increase, which can lead to heart disease--a life-threatening condition, reports Harvard School of Public Health. The American Heart Association recommends that your daily saturated fat intake remain less than 7 percent of your recommended total daily calorie intake. Fats are necessary for overall health and body function, but unsaturated fats such as monounsaturated and polyunsaturated fats are what you should consume. Butter contains high amounts of saturated fats. Foods made with butter also contain high amounts of saturated fat. Therefore, it is important to limit your use of butter to decrease your saturated fat intake. Poultry such as chicken, turkey and duck all contain saturated fat, but the highest amounts of saturated fat are found in their skin, notes the Discovery Health website. To decrease the amount of saturated fat contained in poultry you should cook it without the skin or if it is prepared with the skin remove the skin before eating. Whole milk and products made with whole milk contain significant amounts of saturated fats. Possible products that can be made with whole milk include ice cream, yogurt, cream, sour cream and cheese. To eliminate the high saturated fat content often found in these products you should look for products made with skim milk soy milk. Also, when making your own baked goods you should use skim milk or even try using soy milk as an ingredient in the baking. Meats that have been processed such as bacon, sausage and bologna contain high amounts of saturated fat. These processed meats are also high in calories and have limited nutritional value. Therefore, they are not a recommended addition to a healthy diet. Consuming the yoke of the egg will provide you with high levels of saturated fat. The yoke also contains high amounts of cholesterol. When using eggs in meals or eating eggs it is beneficial to your health to use only the whites of the egg and avoid consuming the yoke. 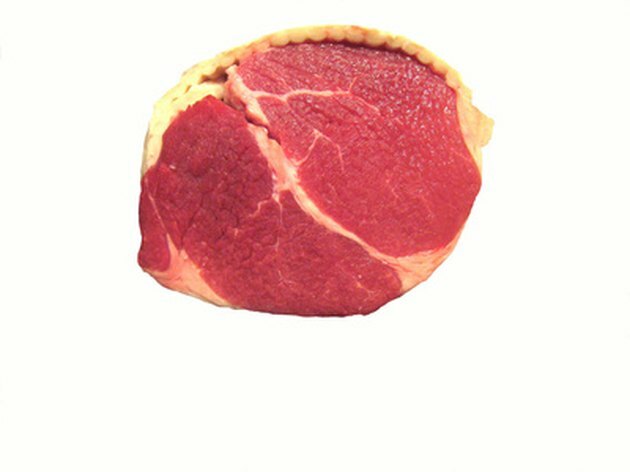 Names for fatty meat that are high in saturated fat include steak, porterhouse, T-bone, sirloin, ribeye, filet, hamburger and ground beef. Harvard School of Public Health reports that meat is one of the major sources of saturated fat peoples died in the United States.